Global industrialization has led to the proliferation of industrial wastewater sources that have the ability to overwhelm conventional water treatment infrastructure in locations where water resources are limited. The cost of the resulting contamination has frequently been met by the local population or creates an unsustainable environmental burden. 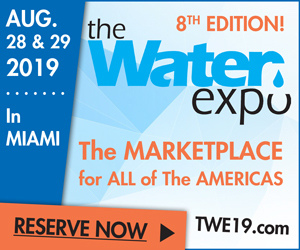 The water industry is striving to develop effective treatment technology that can treat water at the point of generation, which has the potential to dramatically improve water reuse efficiency. Luckily, one such solution has been found in diamond, quickly emerging as an unexpected yet effective ally to wastewater treatment scenarios. Why? Diamond is celebrated as a stable allotrope of carbon, surviving in nature for billions of years. For the past 60 years, materials-growth technology has been developed that has fueled the manufacture of new types of synthetic diamond, tailored to exploit its properties. One of those properties is a semiconductor material that when heavily doped with boron, results in a metal-like electrical conductivity while retaining its renowned robust properties. Conventional biological wastewater treatment methods have often been overwhelmed by very high concentrations of chemical oxygen demand (COD) >10,000 mgL–1, ineffective when presented with recalcitrant compounds (such as phenols) and can be severely disrupted by compounds such as ammonia, nitrates and phosphates. 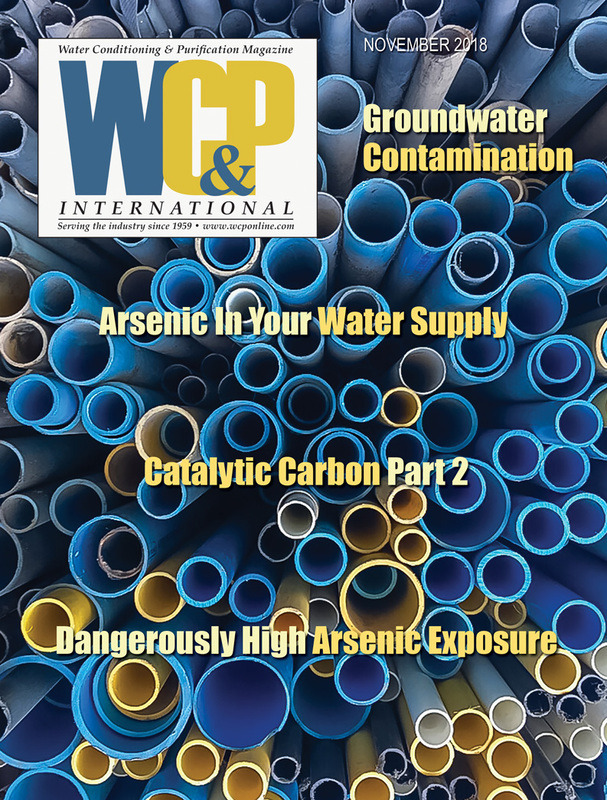 Since the 1990s, a variety of advanced oxidation processes (AOPs), have emerged that have the ability to mineralize recalcitrant dissolved organic and inorganic contaminants in toxic and biocidal wastewater streams. All of these methods draw on the creation of hydroxyl radicals, which have the requisite oxidation power and have found application in the treatment of low concentration, hard COD, effluent streams. Figure 1 Left: Failure mode of a 50-µm thin-film diamond electrode manufactured as part of a research program into thin-film electrodes. Right: At ~0.7 mm thickness, freestanding diamond electrodes ~130 mm in diameter are robust and have been deployed in the field for many years. All types of metal-based electrodes are less effective, as they are rapidly self-consumed by any radicals they generate and because of the potential needed, drive high oxygen evolution rates; overall, the vast proportion of the applied power is wasted. Hydroxyl radicals are a very short-lived species appearing at the anode surface. 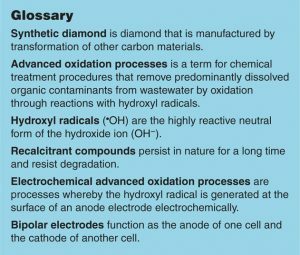 It is diamond’s extraordinary chemical inertness that enables it to exist for a few critical nanoseconds on the surface and be available to oxidize dissolved pollutants in wastewater streams. Figure 2. 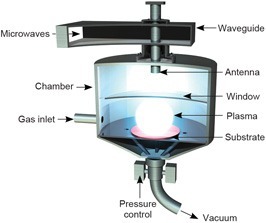 A schematic of a high-rate deposition microwave plasma-enhanced chemical vapor deposition reactor. It can be used to create high-purity, freestanding boron-doped diamond. By eliminating the inherently fragile substrate, a robust diamond electrode is created. Luckily, there is a possible solution for the inadequacy of thin-film diamond electrodes that can be found within the synthetic diamond industry. Over the last (approximately) 20 years, freestanding diamond (manufactured using microwave plasma-enhanced chemical vapor deposition [CVD], see Figure 2) has been establishing markets in demanding industrial applications, such as optics for high-power industrial lasers, thermal management in power electronics, as well as more traditional tool applications in advanced manufacturing. The high deposition rates that can be achieved by this synthesis technique enable self-supporting, freestanding, high-purity diamond electrodes to be fabricated. With no substrate to be dissolved by the hydroxyl radical, the primary failure mechanism of thin-film diamond electrodes is eliminated. A further benefit of switching synthesis techniques is that highly doped, solid boron-doped diamond (BDD) electrodes have a wide solvent window, enhancing electrochemical processing efficiency. While a high-rate deposition technique is limited in the area of deposition, however, electrodes are typically less than 150 cm2. The two principle reasons microwave plasma-enhanced CVD was overlooked for electrode applications were that it is technologically complex to develop and it is inherently limited in deposition area. Simpler, thin-film techniques capable of slowly growing lower-purity thin films of diamond over larger areas were favored. When selecting an advanced oxidation technique, consumable costs are the critical factor. 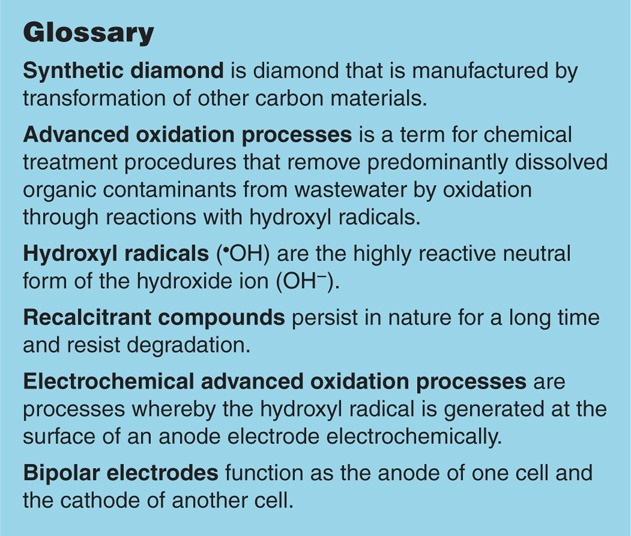 In the case of EAOPs, the dominant cost is the electrical power used to generate the hydroxyl radical and the consumable cost of the diamond electrodes. The amount of energy used to mineralize dissolved organic pollutants, expressed in kilograms of COD, into CO2 is in the range of 20 to 60 kWh, depending on the conductivity of the effluent. 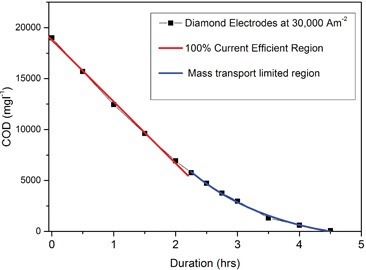 As the work done is proportional to the total charge flowing through the cell, a significant advantage of solid diamond electrodes is that they can operate in a range greater than 20,000 A/m (normally electrodes used for electrochemical processing operate at <1,000 Am–2), without the loss of effectiveness for more than five years, thus dramatically lowering the consumable costs when expressed per kilogram of COD removed. Figure 3. Bipolar electrochemical cells can be designed capable of operating at current densities of 30,000 amp/m2 from 45 to 180 kilowatts (kW), using up to 21 solid diamond electrodes with the capacity to mineralize dissolved pollutants at up to two kilograms (kg) of COD per hour. To maximize the utilization of the oxidation capacity of solid diamond electrodes, ultra-compact, current-density electrochemical cells are needed. Bipolar cells (see Figure 3) that can be operated in either polarity are needed since other electrodes cannot survive in these conditions and fouling in industrial effluents can be encountered. Cell materials are required that are capable of operating at extremes of pH, since solid diamond electrodes can be operated in extremely oxidative or reductive effluents and themselves locally generate pH 1 (cathode) and pH 14 (anode) conditions. Supporting robust but brittle electrodes while enabling high recirculation flowrates, up to 25 m3 h–1 , requires a significant engineering development process. Figure 4. Characteristics of a bipolar solid diamond electrode cell that enable the overall efficiency of the electrochemical process to be modeled. The red region where COD removal follows a linear trend with time is where the process is operating at its most efficient. The final piece of the jigsaw in establishing the cost of EAOPS is to establish their mass transport characteristics, effectively the transition from when the availability of dissolved species in the effluent decreases to the point that the generated hydroxyl radical does not react with them 100 percent of the time, thus wasting the power used. By measuring the rate of COD removal, it is possible to map these characteristics (see Figure 4) and then model the overall current efficiency. 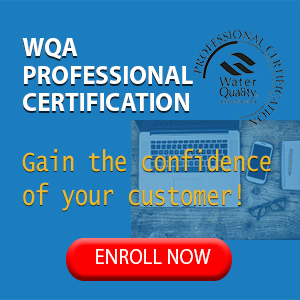 Simply by establishing the input COD concentration, the discharge limit and the flowrate, the number of electrochemical cells and the approximate power consumed to treat an effluent stream can be defined. EAOPS with solid diamond electrodes are an environmentally friendly means of treating wastewaters contaminated with toxic and persistent herbicides, pesticides, chlorophenols, nitrophenols, polychlorinated biphenyls, pharmaceuticals and more. EAOPs have been found effective for a wide range of complex waste streams, including high COD and ammonia-containing streams (such as landfill leachates) and for treating process waters in textiles, pharmaceuticals manufacturing and oil-and-gas-spent caustic streams, among others. 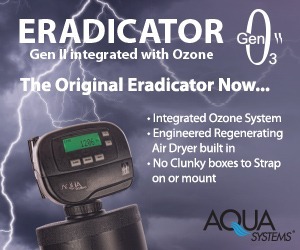 In the context of advanced oxidation treatment technology, this solution is suited for small to medium volumes of high concentration, greater than 10,000 mgL–1 or hard COD effluent streams that otherwise overwhelm indirect techniques based on chemical dosing with hydrogen peroxide and/or ozone. Tim Mollart, PhD, is a principal applications engineer at Element Six and leads the research and application of that company’s synthetic diamond electrode systems. He works closely with customers and academic institutes in the industrial wastewater space, supporting them with next-generation synthetic diamond solutions for extremely toxic water. Mollart is based in the UK and can be contacted at tim.mollart@e6.com. Element Six is a synthetic diamond supermaterials company and member of The De Beers Group of Companies, its majority shareholder. The company designs, develops and produces synthetic diamond supermaterials and operates worldwide with its head office registered in Luxembourg. Primary manufacturing facilities are located in China, Germany, Ireland, South Africa, the US and the UK. Element Six supermaterial solutions are used in applications such as cutting, grinding, drilling, shearing and polishing, while the extreme properties of synthetic diamond beyond hardness are already opening up new applications in a wide array of industries such as optics, power transmission, water treatment, semiconductors and sensors. Introduced in 2016, Diamox is Element Six’s second-generation technology, a cost-effective and highly efficient wastewater treatment electrochemical cell, designed using freestanding, boron-doped diamond electrodes. Diamox is effective in treating extremely contaminated industrial wastewater that cannot be treated by biological methods. This packaged reactor is simple to implement in on-site industrial wastewater treatment systems, providing an environmentally cleaner and versatile solution that can be used across various types of effluents, with no hazardous chemical additions. Diamox has been successfully applied in a pilot project with an industry-leading wastewater treatment company, delivering unparalleled electrochemical oxidation capacity that can be scaled to meet industry requirements.